What is a MT and How to Become One? A Master Trainer (MT) is a individual who is trained and authorised by Dr Paul Lam Tai Chi for Health Institute to train and certify instructors. What are the requirements to become an MT? It is vitally important that MTs have the right abilities and attributes for the job. Have the right mixture of personality, training and experience to conduct the instructors’ certifying class effectively. Being an organiser (co-ordinator) of at least two TCA/TCH workshops. Knowing Parts I and II of Tai Chi for Arthritis well and being certified in TCA. Practicing the Sun style 73 forms at a high level. Must have attended Dr Lam’s Depth of Tai Chi for Arthritis workshop at least once. Being a leader/instructor of Tai Chi for Health programs. Having the right qualifications and experience to conduct TCA/TCH workshops and communicate effectively with participants. Being prepared to be available to conduct the instructor/leader workshop six times per year, but at least two workshops per year to maintain the qualification. Being passionate about using the Tai Chi for Health programs for improving people’s health and wellness. Holds a current CPR qualification or equivalent. Participate in MT workshops: A 4-day face-to-face and the one week “Exploring the Depth of Sun 73 Forms” workshops. Both workshops contain a comprehensive curriculum including in-depth knowledge of tai chi, teaching skill, how to deliver the program, the knowledge of chronic conditions and all other aspects of the programs. Mentorship: Required to conduct two workshops under the mentorship of a fully qualified MT. Follow Up: MTs are required to practice tai chi regularly, give support to people you have trained. Be updated every two years. All MTs are listed on this website. Our goals are to empower people to improve health and wellness through using the Tai Chi for Health programs, and to uphold the high quality of our programs. Please read the above requirements carefully. It is important to know why you want to be an MT. Do the above requirements fit into your goals in life? If the above fits into your goals and you have satisfied the requirements, please ask an MT to nominate you and another one to second the nomination and then the two MTs will contact Dr Lam. For your information: You can learn the Sun 73 at the annual one-week Sydney workshop (second week of January) or at the USA workshop (usually the middle of June). Dr Lam’s Sun Style 73 Forms instructional DVD is very helpful, however face-to-face training is essential to reach a high level for MT requirements. Do keep up with your interest and dedication to Tai Chi for Arthritis. 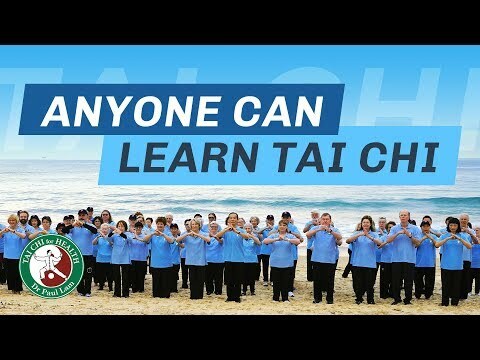 If your goal is to improve people’s health with tai chi, then there is plenty of space and work with the Tai Chi for Health community whether you become an MT or not. Becoming an MT is like practicing tai chi, when everything flows at the right time and rhythm, the right event will happen. The flow comes naturally when everything is right.